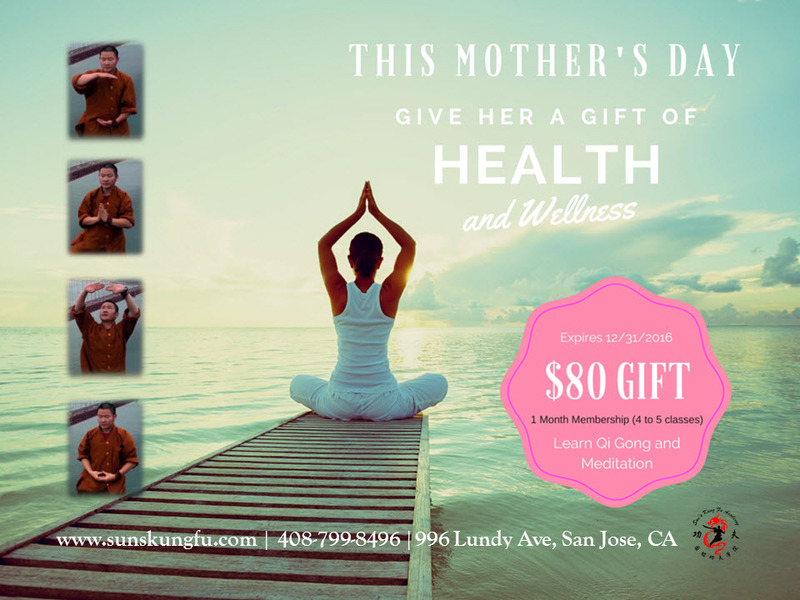 A Gift of Health and Wellness On This Mother’s Day | Sun's Kung Fu Academy: San Jose's Best Chinese Shaolin Kung Fu School, Martial Arts for Kids and adults. Learn Shaolin Kung Fu, Adult Kung Fu, Chinese Wushu. Shaolin Kungfu Classes, San Jose Kung Fu Classes. Martial Arts Classes. Kids Kung Fu Classes. Adult Kung Fu Classes. Kids Martial Arts. Health, Qi Gong Classes. Meditation Classes. Fitness. Workout. Classes available during spring break and summer. San Jose, California, 95133. Sun's Kung Fu Academy: San Jose's Best Chinese Shaolin Kung Fu School, Martial Arts for Kids and adults. Learn Shaolin Kung Fu, Adult Kung Fu, Chinese Wushu. Shaolin Kungfu Classes, San Jose Kung Fu Classes. Martial Arts Classes. Kids Kung Fu Classes. Adult Kung Fu Classes. Kids Martial Arts. Health, Qi Gong Classes. Meditation Classes. Fitness. Workout. Classes available during spring break and summer. San Jose, California, 95133. On this Mother’s Day (May 8th), let her know how much you care for her. We know your mom will love anything you give her, but this time how about giving her something that will last a lifetime? How about a gift of health and wellness? We believe a healthy life is a happy life. Let us celebrate this Mother’s Day by starting her on a path to better health and wellness with our unique Shaolin practiced Qi Gong and Meditation classes! Give her a month of Qi Gong and Meditation classes for $80 (one month membership of 4 to 5 classes on Saturdays and Sundays). Learn from our Shaolin Masters with 12+ years of experience practicing these techniques which are widely used by people in Asia to achieve health and longevity. Our exercises are conducted using BaDuanJin and YiJinJing gentle movements and breathing techniques to help boost energy, improve circulation, balance, reduce discomfort caused by stress, achieve peace of mind, and improve upper and lower muscle strength and flexibility. This is a special gift to last a lifetime. Everything she learns in our classes can be practiced at home so she can continue to build her health for the rest of her life. To get this $80 gift for your mother (or other family members and friends), simply click here to send us your information or call us at 408-799-8496. Thank you for visiting us! Here is a link to a brief preview of our Qi Gong and Meditation class. Also be sure to click here to LIKE us on Facebook to receive our latest updates! Sun’s Kung Fu Academy offers Kung Fu (Chinese Martial Arts) classes for Kids and Adults. Our Qi Gong and Meditation classes are for adults of all ages. Please check our schedule for class times. To register for class click here. Tues to Fri: 3:30p.m. to 8:00p.m. Sat and Sun: 9:00a.m. to 5:30p.m.